The Sunday Times, with Ingear, Britons largest selling Sunday motoring newspaper is saying some very nice things about our economy tuning in this weekends paper. 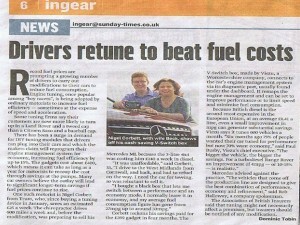 The Sundays Times tested one of our V-Switch tuning systems with great effect this week. The V-Switch is a portable customer based car tuning system, that is truly simple to use and gives you ultimate flexibility in what you want from your vehicle. Designed to be used by the driver in the comfort of their own home it is capable of reading and writing tuning programmes for many different vehicle types. Uniquely, it can also store in its memory three different files dedicated to the same car – one original file and two tuned files. Economy tuning and fuel saving is of course of great interest to many customers, with fuel prices at an all time high, and seemingly getting higher by the day motorists are looking for proven and tested ways to save fuel. Viezu’s fuel economy and fuel saving tuning is just such a service, our economy tuning comes with the same with 30 day money back promise, so you can try and buy with confidence.